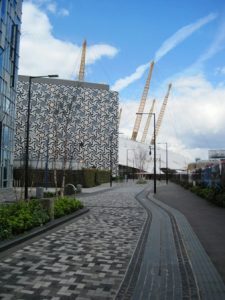 The Greenwich Peninsula is a tongue of land to the east of Greenwich Town Centre projecting north into the River Thames. On its northernmost tip is the O2 Dome/North Greenwich Arena and the new Emirate Airlines London Cable Car. The eastern part of the peninsula is mainly open parkland and to the south are the apartments, shopping area, cinema and school which are the first phase of the regeneration of the area. To the west of the peninsula beyond the A102 Blackwall Tunnel Approach Road is heavy industry. To the north west of the O2, in the river, is a modern sculpture which consists of the bridge of a ship sliced away from the rest of the boat. This is called Slice of Reality by Richard Wilson. To the north east is Anthony Gormley’s Quantum Cloud which is a 30 metre high sculpture made of tetrahedral steel units. The Thames Path passes to the east of the dome and is pleasant to stroll along. On the foreshore are the boats of the Greenwich Yacht Club and the Thames Barrier can be seen in the distance. To the south east of the O2 is a long thin park between the roads East Parkside and West Parkside and lying parallel to the river. Alongside each of the roads are stands of trees and there are wooded areas within the park itself. About 200 metres south of the northern boundary of the park, River Way cuts across the park. Along the soth side of this road is a 200 year old terrace of dockers’ houses at the end of which is the Pilot Inn which dates from the same period. 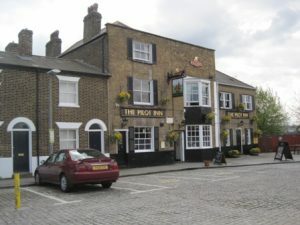 The Pilot Inn serves good food and has a large and well maintained garden to the rear. 100 metres south of River Way is Greenwich Millennium Village. If you walk east along the frontage of the apartment blocks of this development you will come to the river. A few metres south along the Thames Path takes you to the entrance of the Greenwich Peninsula Ecology Parkwhich is an area of wetlands behind Greenwich Millennium Village. To the south west of the Millennium Village and across Bugsby Way is the Bugsby Way retail park which hosts an Imax cinema, restaurants, retail warehouses and an outlet of a major supermarket chain striving to display its green credentials in the form of whirling windmills and a green roof next to the retail park’s large car park. The northern tip of the peninsula is well served by public transport: North Greenwich London Underground Station is here, one stop from Canary Wharf on the Jubilee Line and there is a major bus terminal next to the station; the London River Boat Service at Queen Elizabeth II pier provides fast transport via the River Thames to Canary Wharf and piers in Central London. Services on the nearby Emirate Airlines London Cable Car to Royal Victoria Dock will commence soon.